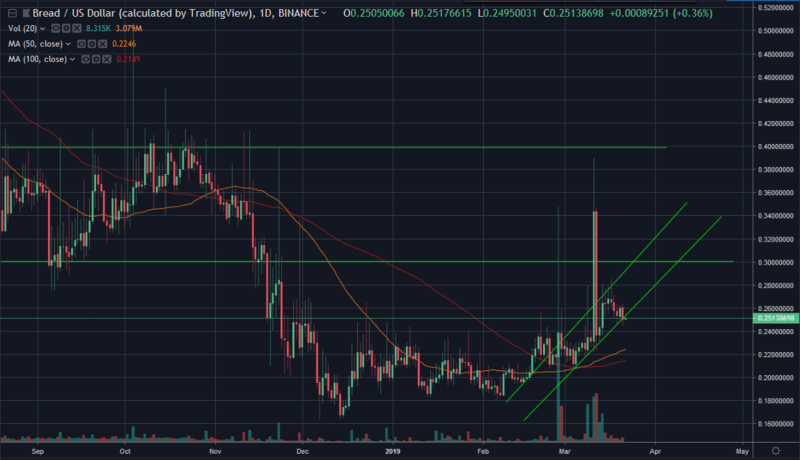 As all the signs are in place that we are heading into Altcoin season, now is a good time to take a look at some coins that maybe aren't getting as much attention as some others. A few coins have already stood out against the market, but today we're going to look at three coins that haven't had a breakout yet, but are almost certainly going to. Let's dive in! MANA is the ERC-20 token that powers Decentraland, a virtual world built on the Ethereum blockchain. MANA is used to purchase LAND inside of Decentraland, as well as pay for goods and services in the world. LAND plots can vary in price, but some have been sold for well over $100,000 worth of MANA. While still in an early form, if Decentraland builds popularity it could see the value of MANA skyrocket. Looking at the 1 hour, we can see we have broken below the MA's and are testing the bottom of the ascending channel the price has been in. While we are slightly below now, the next few hours may see the price return inside the channel. Moving to the 4 hour, we see that the 50 MA is helping to define the bottom end of the channel that we are testing now. We see additional support just below from the 100 MA. Finally, moving out to the daily, we can see where the price switched from a descending channel to an ascending one. 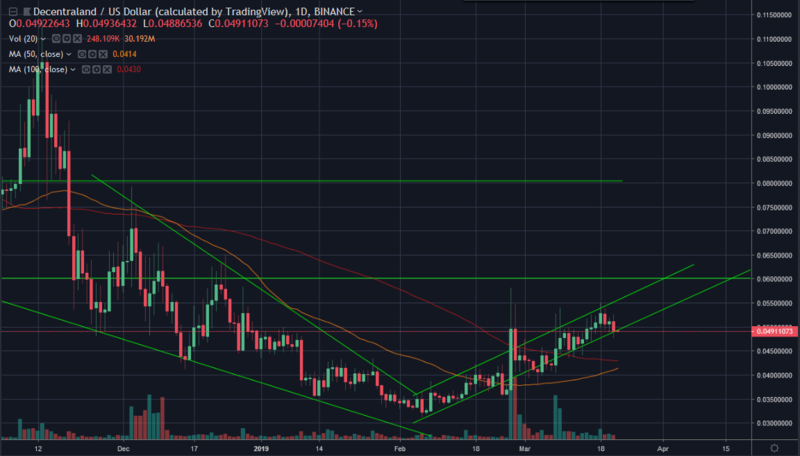 It also becomes clear that the target we are looking for to get out of "crypto-winter" is $0.06, which this channel seems to be leading us to. Bread is the native token of Bread Wallet, and works in many ways like Binance Coin (BNB) works for Binance. Users get discounts on transactions for using BRD, and holding Bitcoin in the Bread wallet can earn users additional BRD. The team promises in time additional benefits will be rolled out, but understand that BRD basically acts as a reward system for Bread wallet. Seeing as bread wallet is one of the more popular bitcoin wallets out there, as adoption grows it stands to logic BRD value could rise. 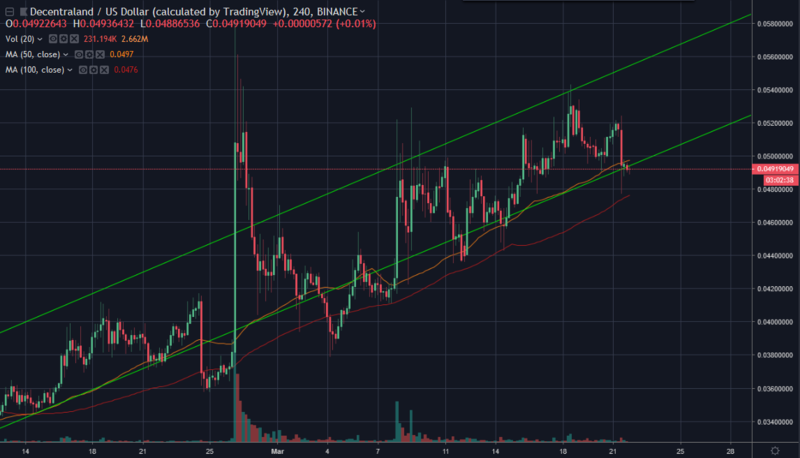 Looking at BRD on the 4 hour, we can see that here too we are testing below the channel that the coin has been in for some time. 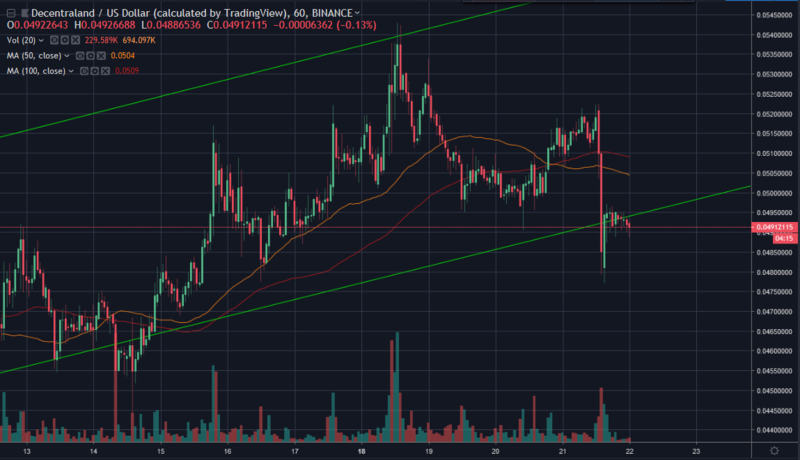 It looks like the 100 MA may be providing the support we need not to fall here, and hopefully in the coming hours the price will return inside the channel. 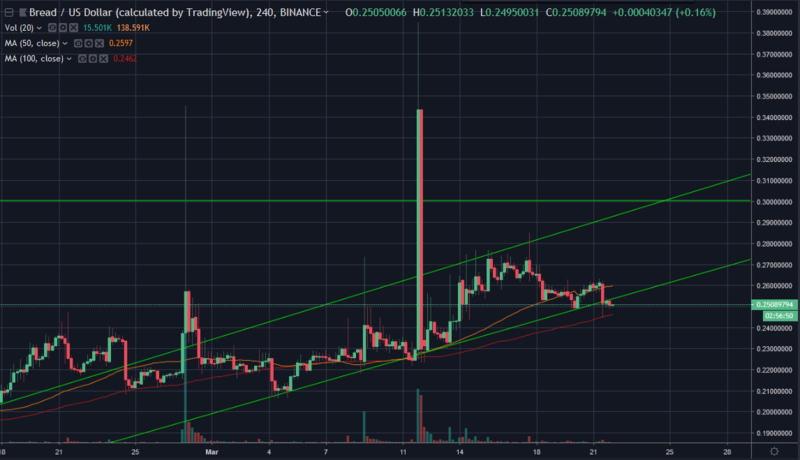 Moving to the daily, we see that this channel is heading to test up to $0.30, and if we can break through there maybe we can try to reach the true target of $0.40, to again get us out of this slump. 0x is an ERC-20 token that aims to power decentralized exchanges. Its goal is to enable fast and easy transfers between any type of token on the Ethereum network, and to do so in a way that is both decentralized and accessible to anyone. It could revolutionize the way token trading works on Ethereum, and was fairly recently listed on Coinbase, meaning it is a fairly easy onramp for newcomers to cryptocurrency. Looking at ZRX on the 4 hour we see we just broke down out of a wedge that had been forming from a rising support line and psychological resistance at $0.28. 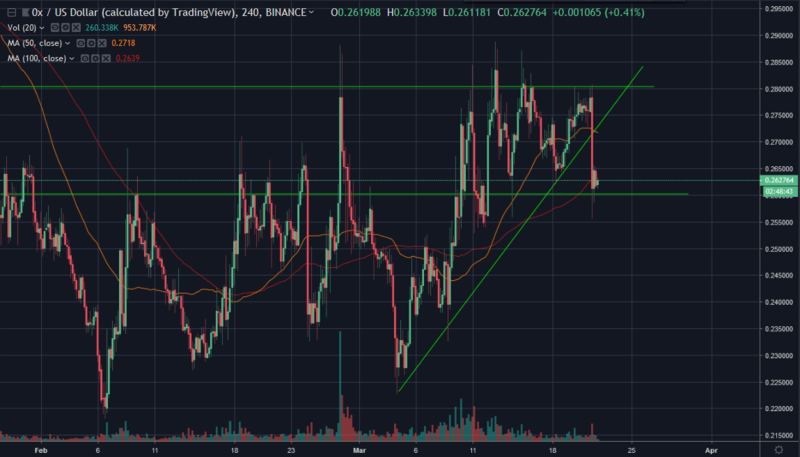 It looks like we did find support above $0.26 though, so hopefully the price can test back up. On the daily scale it is easier to see how we have become stuck between the 50 and 100 daily MAs. 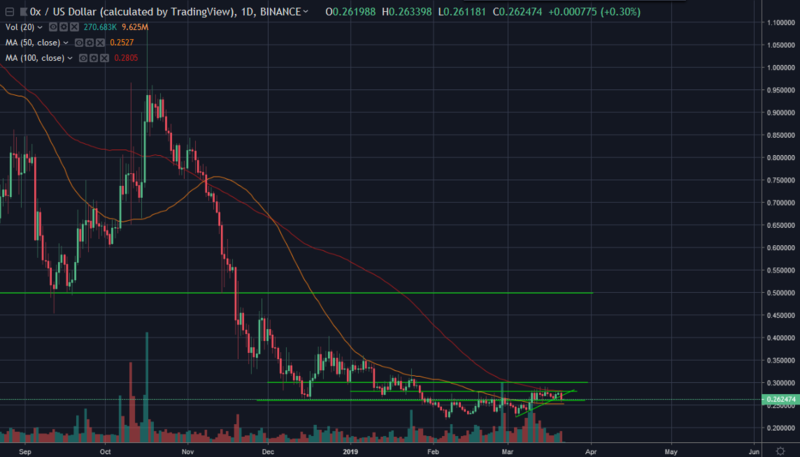 It is also clear we need a break upward to test to $0.50 in order for this coin to put the consolidation phase behind it. Each of these coins has a way to go to truly begin seeing the next bull run. However, all have solid fundamentals and active communities, which is what will separate the winners from the losers during the next cycle. This is in no way investment advice or shilling, as there are many more coins out there worth looking into, however these three do look poised to be players in the future of crypto. Would you consider buying any of these coins?